I'm interested in the hard costs of the project, which weighs in at a total of $5,100,000USD. You can trace the evolution of the project back to the original November 2007 project summary and watch the numbers dance around as they move towards the final plan of operations, signed in March 2008. Between November and March they realize the need for school servers (at over $1,000USD each), energy and security solutions, as well as increase their setup, implementation, contingency, and measurement costs, (contingency spending alone goes from just under $16k to almost $260k). Since the 5.1 million total doesn't shift, these costs are taken out of other parts of their implementation plans. IADB's laptop purchase goes from 7,000 to 3,700 (OLPC is providing another 10,000 XOs presumably from G1G1), training and content gets cut down by $200,000, and maintenance gets $30k shaved off. The end result is focusing on 13,200 students plus 500 teachers (the November plan was for 19,000 students, but didn't have laptops for all of them or any teachers embedded in the budget) in forty communities. The student:teacher ratio would be a respectable, if not quite believable 26.4:1 . I'm creating a spreadsheet to hold all of this information with some formulas to sort it out that you can look at yourself. You can view the entire spreadsheet to see what went where in detail at this Google Spreadsheet of the OLPC/IADB costs with the formulae visible to see how I constructed my numbers (and the linked PDF files have the original arrangement of the costs if you're so interested). Michail had a conference call with SES-Americom. They agreed to provide the (C-Band) space segment and internet termination (via their Maryland teleport) for our upcoming deployment in Haiti. So I'm going to guess that that's $3k for a VSAT installation with donated bandwidth; with no maintenance budget or money for a paid subscription if the bandwidth donation ever dries up -- does the community have any insight on this? As for the other "line items", I was $10 over per laptop on total implementation costs, and $2 over on maintenance costs, not bad. If I presume that an Internet connection is free of cost, my original number 972 less five years of Internet access (coming in at $541 using the UN dial-up costs discussed here), I end up $11.94 cents higher than a 5-year projection of the IADB's numbers, (not accounting for the change in the laptop price from $148 to $188). So if anyone can provide some on-the-ground information about bandwidth costs in Haiti (all the ISP websites I found were broken in one way or another); we can see what the ongoing costs of this project will be. Of course, the budget was based on fuel costs that were when OIL was $90 a barrell and now it has increased 50%, but that can be changed in the current spreadsheet quite rapidly. I'll go dig into this information, since so many poorer countries will just depend on the World Bank blessing for anything major to happen. These numbers so far show that to depend on connectivity to the internet is to make every cost run over. Can't say I am happy to have confirmation in predicating that the obsession with the Internet is not the right way to go, but if these sobering numbers help us look for alternative approaches, that would be a Good Thing. Glad to see someone else tracking this development. I have been in Haiti almost two years, internet is a huge issue. All service "providers" here offer about the same pricing schemes for varied levels of service. Currently operating Hughes Net. Home: $59.99 USD 700Kbps /per month rate. All of these have a non-advertised "usage" limit. If you exceed this unknown limit, Hughes "throttles" your service for 24 hours to where you have very limited use (about dial-up speed). I currently have an un-advertised plan for 199.00 USD/Month with a 2 watt reciever in my attempts to have reliable swift internet and no worry with exceeding thier non-disclosed usage limit. Reciever and HN 7000s router, with installation was $1000.00 USD. Just as a note, they actullay provide me with an address in Florida.....not Haiti as the "pyhsical" address.....last year another "provider" that I utilized has done the same....seems there in no recognition of Haiti address, one must have a "ghost" address in Florida. Also note.....even though posted "speeds" are always shown in writing as "up to....2000Kbps" the norm is more like 400 to 700....highest I have experienced is 1200, for a brief moment in time. Let me know if you find one, I need the service. Quite interesting stuff. Here in Peru the guys running the project have stated that they don't have the resources to do any kind of follow-up, testing or running assessments of the impacts / quality / whatever of XO-1 deployment. It is more or less obvious that they have decided not to look after any external support whatsoever. Peru could provide very interesting information since deployment is being done at the kind of communities that are the alleged target population, without the issues that a failed state like Haiti brings. But, alas, nothing is going to be done. Eduardo VM: The recently-released WorldBank/InfoDev handbook on monitoring and eval of ICT for education projects is worth a read of the overview if nothing more; it's very mixed on whether ICT4E is worthwhile, but strong in advocating for better M&E standards -- no doubt it's sharing (very) similar influences with the IADB's ICT4E projects such as this. At least something is being done to help computer "literating" the children in the world and give them access to the wider world. Of course, there is always a cost associated with "progress". Investing in the children is the best there is. At the end of the day, the altruistic efforts and the sacrifice will be well worth it. Let's us continue to derive pleasure in giving to the less fortunate rather than amassing fortune which we cannot take with us when we are recalled by our maker. Peace. 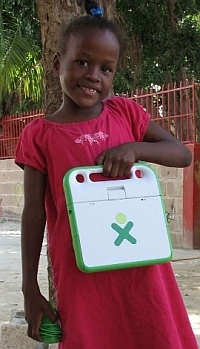 Hey there - anyone have an update on the situation in Haiti with the OLPC rollout given the current devastation and crisis situation there?